Books for all ages come boxed for entertainment pleasure. 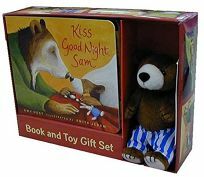 Kiss Good Night Book and Toy Gift Set packages the board book edition of the title by Amy Hest, illus. by Anita Jeram, with a hand-size plush version of Sam the bear cub. PW said of the book, ""Hest pays tribute to reassuring bedtime rituals that assuage a toddler's fears."" .